Discussion in 'Buy / Sell / Trade' started by low12, Sep 29, 2010. 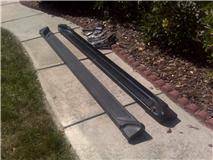 For Sale: OEM Running Board for 1st Generation Tacoma CrewCab 4DR with hardware. $100. OBO. Zip Code 23456 in Virginia.